Just before the final season of Game of Thrones was about to air, “60 Minutes” reporter Anderson Cooper was still busy trying to get to the bottom of what actually happens at the end of the series. No spoiler alert needed here: Cooper didn’t get a lot in the way of answers for how producers David Beioff and D.B. Weiss concluded their epic cinematic series for HBO. Cooper’s quest for answers — which aired Sunday night on CBS with additional clips posted online — took him from Los Angeles to interview the producers and cast all the way to Belfast in Northern Ireland to visit the set of Castle Black with Kit Harington, who plays one of the series’ numbered surviving characters, Jon Snow. Cooper even sat down with George R. R. Martin, the author of the books that the series is based on. Martin originally planned to finish his series before the show but missed several deadlines, Cooper said. That meant that at the end of last season, the series eclipsed the books, leaving fans — even the die-hards who read all the books — in the dark. In the interview with Cooper, not even Martin seemed to know exactly how the show will end. While preparing for the final season, Martin spent several days explaining the over-arching themes for the final two books to the showrunners. The series has been “extremely faithful” to the books, Martin said. Even still, there was no way to get all the details in. “I don’t think that Dan and Dave’s ending is going to be that different from my ending because of the conversations that we did have, but they may be on certain secondary characters,” Martin said. Martin says he’s fine if fans end up preferring the show’s ending over the book’s eventual conclusion, or vice versa. “Game of Thrones” has certainly been far from ignored and the cast has been constantly hounded for any details about the final season. John Bradley, who plays Samwell Tarly, hinted to Cooper in a clip online that fans might not be thrilled with the ending. “We’ve never given people what they think they want because we know that people really like to be challenged and they don’t like to be spoon fed,” Bradley said, noting the infamous “Red Wedding” where several characters were killed off. But Peter Dinklage, who plays Tyrion Lannister, gave another slight hint about at least the tone of the ending. The show has become infamous for its graphic depiction of violence — particularly against women. 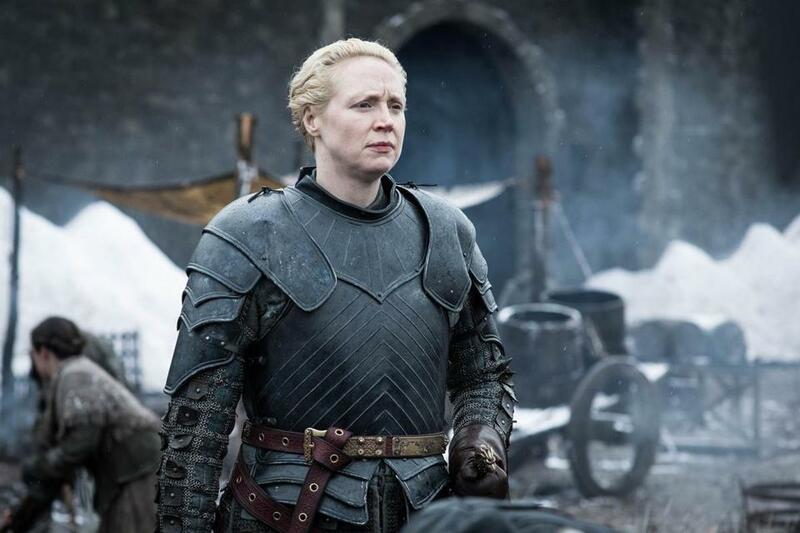 But Gwendoline Christie, who plays Brienne of Tarth, told Cooper that there is a lot audiences can learn from the violence. But when the final credits have aired, where do the countless props, costumes, and dummy corpses end up? As it turns out, for now at least, most of that has ended up in a warehouse in Belfast. Harington gave Cooper a tour of the warehouse, pointing out everything from Bran Stark’s chair to his father’s head. 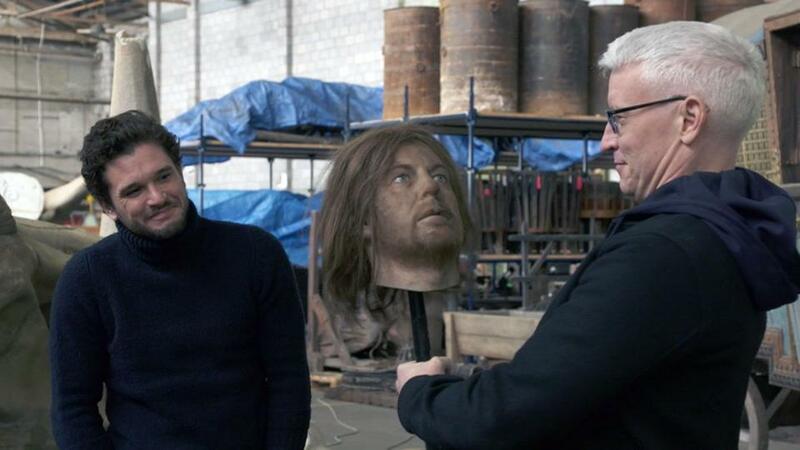 That’s right, the head of Ned Stark is being kept in a plastic storage container. In the “60 Minutes” segment, Cooper leaned in to his likeness of a white walker (what with his piercing blue eyes and startling white hair), and was transformed into one of the mythical beings after undergoing a four-hour process involving prosthetics and heavy costumes. Even with all that, he still needs some CGI sparkle added in post-production to get that iconic white walker gaze. Maddie Kilgannon can be reached at maddie.kilgannon@globe.com.